I’m not 100% lizard! Wait, I should explain. Remember about six or seven weeks ago, when I spit in that tiny clear tube, added a milky blue liquid substance to it, shook it up and hoped it didn’t explode in my hand, then mailed it off to Ancestry.com to find out my heritage history and pray it didn’t come back as, “NO DNA FOUND”? Well, I exist! And I’m not a pod person. Nor a lizard. I’m happy to report that I am in fact a chic, stylish, posh European! Sort of. In my head. 29% of me is. But it’s the majority of the results, so that’s my story and I’m sticking to it! So check this out – this ^^ is my report. I’m basically English, too. Which makes sense, since I spend most of my days honing my best London accent. Because I probably live right in the heart of London, you know. Or maybe right outside of London, in a quaint village cottage, with thick green ivy climbing up the sides. 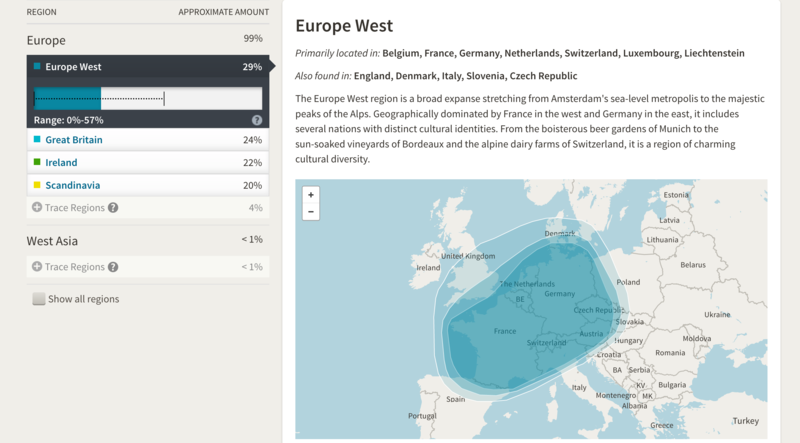 Except that the report CLEARLY shows that I’m French. So I’m obviously living in Paris with my slew of black and white striped shirts. AND Belgium. And London. I’m very cultured like that. Do you happen to remember on December 2nd, 2016 at 7:13am when I told you about Noble Vines teaming up with Ancestry.com in the whole celebrate-your-roots campaign? Right. So what I DID was, spit in the tube, mix it with the milky blue substance, shake it up, send it in, and wait. 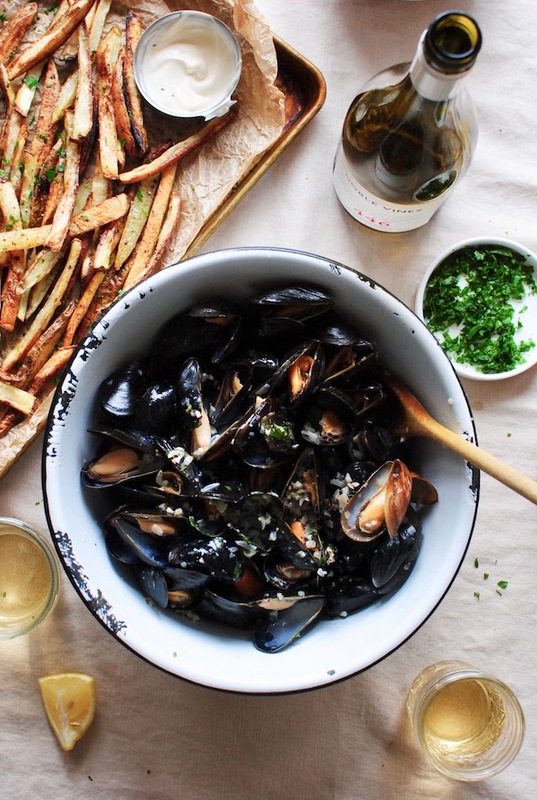 The moment I read Belgium and France – my brain (and stomach) leapt to a hugely traditional recipe mixing the two cultures – MUSSELS AND FRIES. Also known as MOULES-FRITES. Which apparently requires screaming at you. That’s another reason why I decided on this ultra wine-y recipe. 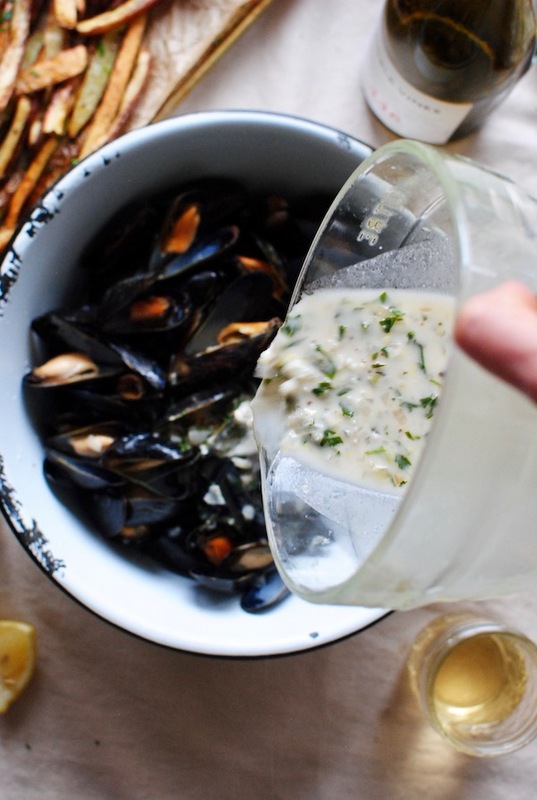 It’s mega traditional to pour at least a cup of dry white wine into the mussels to steam them. And another cup into your face, but we’ll get there. I’ve always loved mussels. I never get the chance to make them at home, because 50% of the mouths in this house are the age of 3. Aaaand that’s why we have fries. It’s the perfect combo for all faces! Baked French fries for them (and me), and the delicate mussels in a rich wine-y, creamy, mustard-y sauce for us. GAH. Hurts me good. 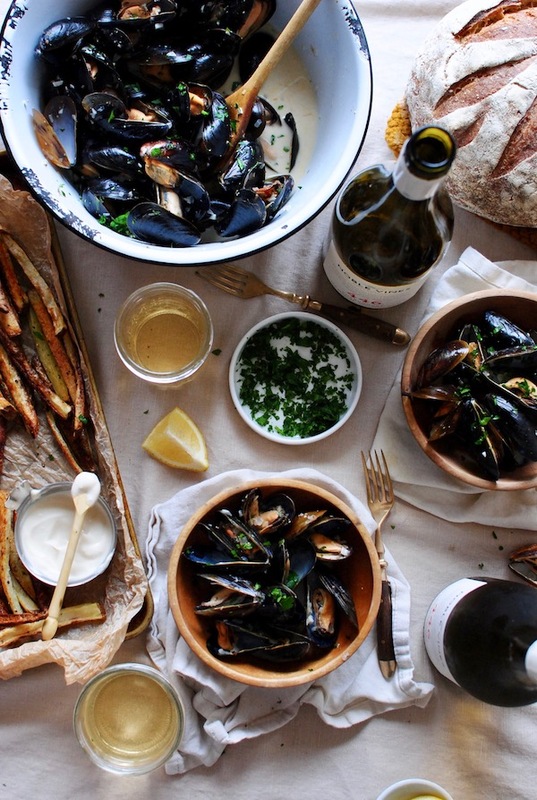 If you’re squeamish or nervous about mussels – dudes, don’t be! I know they seem like this crazy, laborious undertaking – when in fact, the scrubbing under cold water will take the longest (which isn’t even long at all). You basically want to make sure they’re still alive when you throw them in the pan. Alive and clean. No ocean dirt, man. The steaming actually only takes a few minutes. And you can switch up the flavor of your broth, by adding different aromatics, like leeks, minced ginger, etc. I add diced tomatoes and basil once during the summer, and it knocked my face straight off my head and onto the floor. And that’s it! You’ll serve the mussels in bowls, with extra bowls on the side for the shells. Just fork out the mussel from the shell, dip it in the wine sauce, and hoooooooooooly. Being Belgium/French is awesome. The Noble Vines 446 Chardonnay was honestly such a lovely pairing, because dang that wine was smooth! (Plus, in a crazy twist of fate, was originally derived in Burgundy, France. Hey-oh, kismet!) It’s got all these aromas of Golden Delicious apples, pineapple and apricots. Almost creamy, if that makes any sense. And as far as the flavor, we’re talking PEACHES, you guys. And tiny, baby darling hints of vanilla spice. So that, with the fresh, tender earthy mussels – it was like, this perfect seamless partnership with the seafood. Yin and yang. Bam and boom. Yes and YAS. 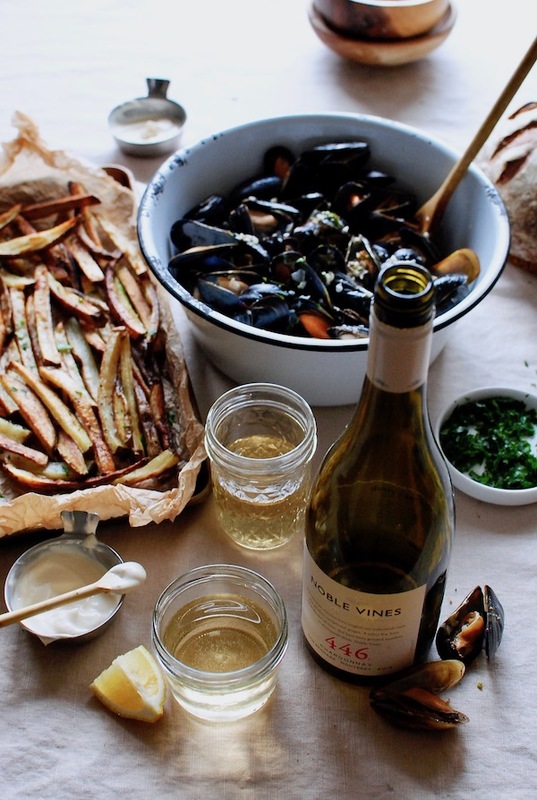 A sip of wine, a mussel, a fry, a sip of wine, a mussel, a fry, a sip of wi – you get it. Invite me over? S’il vous plait? Early in the day, place the potato sticks in a large bowl of cold water. Let them sit about an hour, then rinse the starch off. Dry each fry, arrange them on a large baking sheet, and drizzle with the oil. Season with a pinch of salt and pepper, and toss to coat with your fingers. 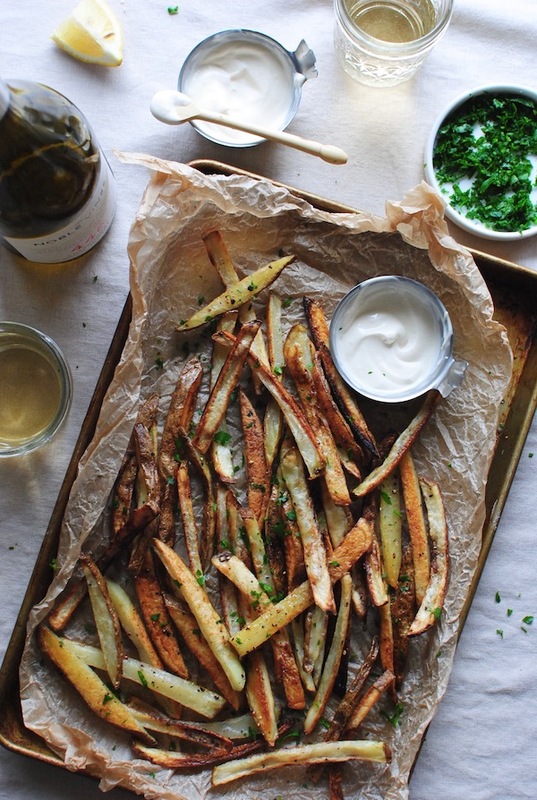 Bake French fries for 45 minutes, tossing at the 20-minute mark. In a small bowl, whisk together the mayonnaise and malt vinegar. There’s your French fry dip! 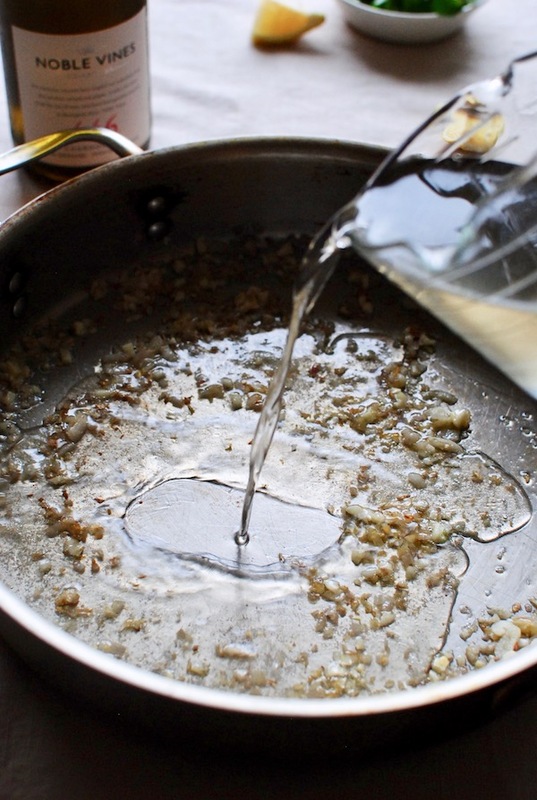 Heat the butter and oil in a large deep-sided skillet. Once the butter is foaming, add the shallots and sauté for two minutes. Add the garlic and sauté another 30 seconds, until fragrant. 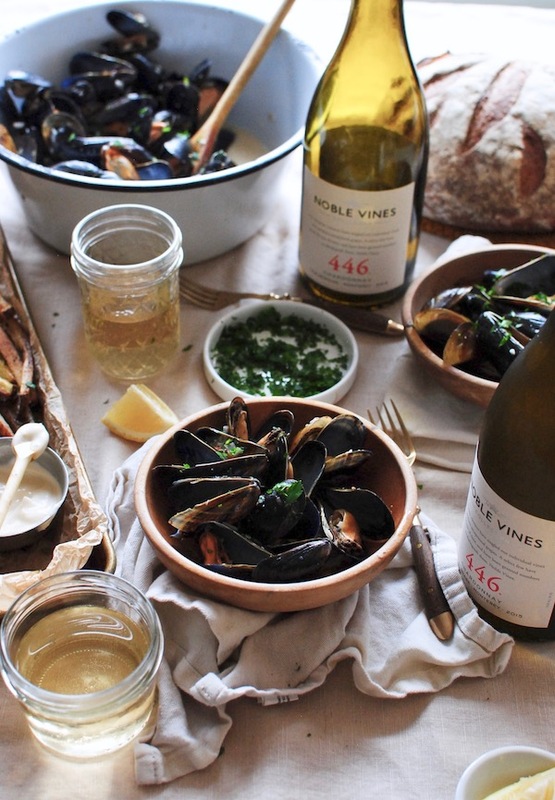 Add the Noble Vines 446 Chardonnay to the pan, followed by the mussels. Cover the pan and let the mussels steam on a medium heat for about six minutes. They should pop open, revealing the mussel inside the shells. If any don’t open up, just toss ‘em. They dead. Well, they’re all dead now, but they were dead before you started cooking them. Never mind. 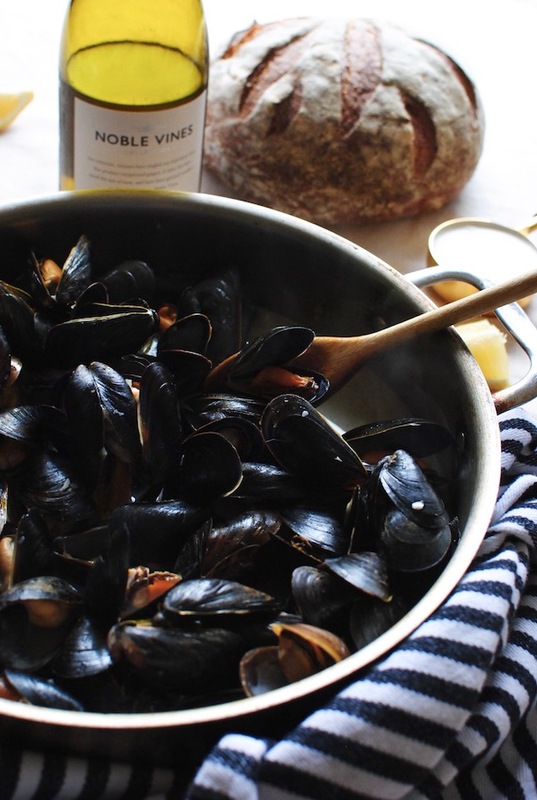 Transfer the mussels to a large serving bowl. Back in the pan, add the mustard, heavy cream, parsley and lemon juice. Maybe a grind of black pepper? Sure. Let it simmer for about a minute, then pour the luxurious sauce over the mussels. 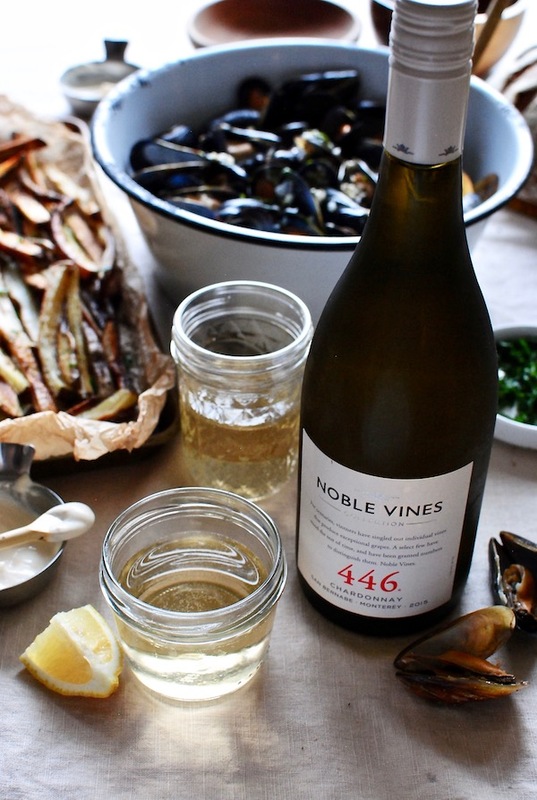 Serve with crusty bread, the French fries, and ahem, another bottle of Noble Vines 446 Chardonnay. Duh. Yummmm, all of that on my plate, presto vanisho! Wouldn't it be loverly (name that movie) if you could just wish the food to appear. I was wondering what kind of mussels? I'm from PEI, which is mussel mecca, so its important to us. Cheers and cheerio to your english side by the way. My Fair Lady! (didn't even have to double check, boom.) You know - I don't know! I just walked up to the counter, pointed to the mussels and said, GIMME. I didn't have options though. It was one bag, and one bag alone. I wish I was more help! Ahh this looks incredible! Aren't wine partnerships the best thing ever? I have been working with a local winery, and I get compensated with wine. Which is honestly the best form of compensation ever. Also, so glad you found out that you are in fact not a lizard. You're correct! The wine stays in the pan and becomes a sauce with the mustard and cream. Then you'll pour the whole sauce back over the mussels and dive in. I hope you like it!